Algebra's Friend: Intro to Conics with Rice Krispies! Intro to Conics with Rice Krispies! 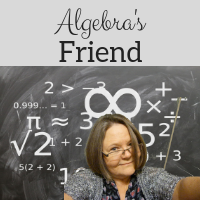 But as Julie tells us in her blog about this activity, she has only one class of Algebra 2. I have SIX! Yes, 149 students. And making 149 cones sounded daunting! I purchased 3 big boxes of HEB crispy rice ... and 7 bags of HEB miniature marshmallows. 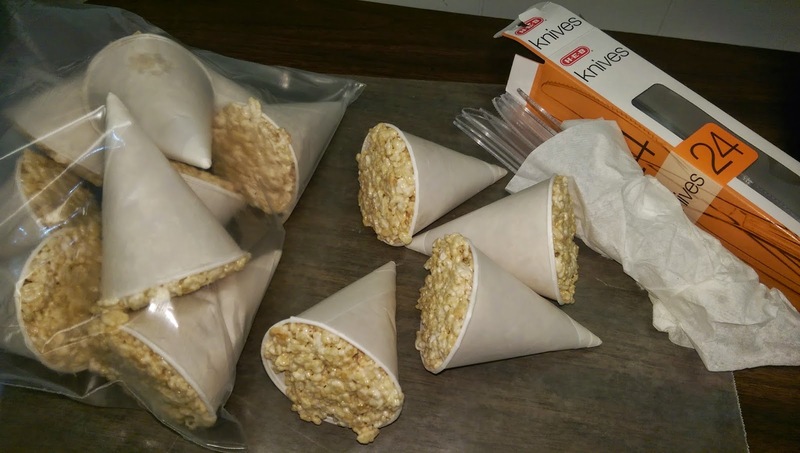 I was tired last night ... but I persevered in making 50 cones ... using about half of those ingredients (4 recipes of 6 cups cereal, 10 oz marshmallows, and 3 Tbls butter). I had purchased 4 oz cone water cups ... I found mine at Amazon. I bought one sleeve of 200 cups for about $6. I see my 149 students over two days ... we are on a block schedule. I decided to give one cone per pair of students today. I used 39 cones ... I have 13 left. Tonight I need to make 21 more cones. So why all of that detail ... and all of that work, you ask??? For the smiles, the engagement, the joy of finding hidden shapes in our treats ... and the great give and take math talk all around the room! "Can we eat these?" they asked. Well, of course, you can! 1. Students did a quick web hunt for homework before class today to provide some understanding of conics. 2. When students arrived in class, they shared their homework responses with their partners for just a few minutes. Then I asked a few questions about conics in general and about cutting a cone in particular, using an illustration on the board. 3. I gave each pair some wax paper, a plastic knife and a cone. I asked them to cut the cone to illustrate the four conic sections. At the same time I asked them to discuss these 12 questions. 4. To wrap up this section of our lesson I showed just a short clip (out-dated) of a teacher and student cutting a cone with a band saw to emphasize the relationships between the sections and the central axis and edge of the cone. We continued by learning how to identify a conic section when its equation is given in general form. We also practiced completing the square to rewrite from general form to standard form. In our next classes we will tackle each of the sections one by one ... using Cindy Johnson's conic cards! Conic cards are now online ... find them here! Other blogs about Rice Krispy conics ... here and here. Cindy's cards seem to be for recognition and identification. Do you use them as an intro and then go on to the specifics of the formulas, finding dierctrix, foci, etc.? I use Cindy's cards for only 10 -15 minutes each day. I use them to build fluency with the equations and key information. I spend one class period on circles and ellipses teaching the key attributes, finding the equation from given information, etc. I spend on class period on problem solving with circles and ellipses. Then we spend one day on parabolas combining attributes with problem solving, and one day on hyperbolas, combining attributes and problem solving. Happy to be included in your link. Thanks! When I click on your link to the web hunt and 12 questions, I am not able to access the file. I have sent a request to few the file but haven't had a response. Is it possible to make those files accessible from the links you put in your article?